Having sensitive skin can be a real challenge. If you’re a man with sensitive facial skin, shaving can be difficult and even painful. You’re more likely to experience razor burn, dry skin conditions, acne, ingrown hairs and more. 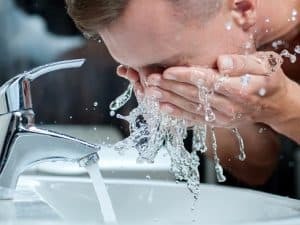 Don’t stress too much though; this condition is so common that the shaving industry has created a variety of products designed specifically to protect your face and combat the side effects of sensitive skin. In this in-depth article, we will take a look at 10 of these impressive products. we have created a list of the top 10 best razors for men who have sensitive skin. These razors have been listed in order and ranked based on their efficiency, ease of use, overall value, real-life user reviews, and protective abilities. 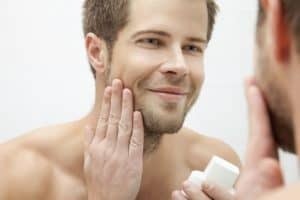 With sensitive skin, should you be wet shaving or dry shaving? What types of razors are best for sensitive skin? Are there different levels of skin sensitivity? How can you tell if a razor will work for you? Now, let’s review each and every razor in-depth. This way, you can decide which one seems ideal for you as an individual. The Feather All Stainless Steel Double-Edge Razor, Model AS-D2 may just be one of the absolute best safety razors available on the market today. This gorgeous razor has it all. It’s sleek, innovative, easy to use, perfectly balanced, and fitted with some of the sharpest and most effective precision blades in the world. This razor is the epitome of quality and luxury. Providing an effortlessly smooth and gentle experience. It works perfectly for traditional wet shaving, the best method for you if you have sensitive skin. Each stroke leaves skin smooth, soft, and clear. This is the next best thing to being shaved with a straight razor at your local barber’s shop. On the downside, this is an expensive option. Still, replacing singular or double straight blades is cheaper in the long run than buying cartridges. It’s also more hygienic. We have now arrived at our best value pick! We have chosen the Butterfly Double Edge – DE as our best value because it gives an exceptional and close shave to users with sensitive skin and includes many extra items, all in one convenient package. Safety razors like this one work well with sensitive skin because they have good weight, sharp blades, and are very sanitary. This razor comes with extra blades, a carrying case, and more. It also is pretty inexpensive. This would be a great option for you if you’re wanting to start using a safety razor but aren’t sure where to begin. This razor does an amazing job of cutting close without causing irritation. Sharp and straight blades are a great option for sensitive skin. Safety razors like this one make it possible to always have an ultra-sharp and clean blade without breaking the bank. The complete travel kit is easy to store, clean, and carry with you wherever you go. This razor may actually end up saving you hundreds of dollars over the years with its inexpensive and easily replaceable blades. This razor nearly made our best value pick; it really is a very good value. That’s why its number three on our list. It balances high-end technology with affordability. If you are going for an electric razor that will help you care for your sensitive skin, this will likely be your best option. It’s priced amazingly considering the amount of tech it features. It utilizes over 70,0000 cross-cutting actions per minute across 5 blades. It also protects your face from knocks, scrapes, and irritation. This razor also features shaving sensors that monitor the differences in beard density for exceptionally impressive comfort. It’s easy to recharge with a convenient USB cable and has high-end ARC foils that gently conform to your facial contours. It can be used wet or dry, but we recommend wet for sensitive skin. This is a great option for anyone who wants to avoid knicks or unnecessary irritation. Its shock absorbent technology adjusts based on your shaving style. It helps you apply just the right amount of pressure. It also has 5 blades and comes with two cartridge refills. The blades are also coated with gel pools for lubricating protection. The gel has herbal extracts that comfort your skin. A great option for those who want a mid-range and inexpensive solution, the Schick Hydro 5 does a good job of treating sensitive skin. If you are wanting a razor with easy to replace cartridges that comes pre-coated, this is one of the better solutions out there. It has been dermatologist recommended for sensitive skin and has 5 blades so that you don’t have to rub raw areas when shaving. It’s designed to assist in hydrating as you shave. It also has a handy little trimmer. On the downside, it can get annoying to keep replacing cartridges. This razor pack is a good option for anyone who doesn’t like to re-use the same razor twice. Each disposable razor has 3 blades that are paired with soothing lubricant. We still recommend using some kind of shaving cream with these razors, but the lubrication effect is pretty nice. The progressively aligned blades help to reduce irritation. On the other hand, you’ll have to throw each razor away after a few shaves. This is one of the best razors that Philips makes in the electric razor segment. It is ideal for anyone who has skin sensitivity issues. The three rotating heads feature a gentle precision system that protects your skin while cutting close. Dynamic flexibility lets these heads move in 5 directions to hug the curves of your face, neck, and jaw. It can also be used with shave creams, balms, and gels. It can even be used in the shower. If you’re wanting an electric razor designed around those with sensitive skin, this may just be your best bet. On the downside, it’s expensive. This foil electric razor does a great job of giving you a fast and effective shave with minimal irritation. It has sensitive skin focused technology that makes shaving pretty darn comfortable. It also has an auto-sensing motor that makes your entire shave more efficient. It is easy to clean, store, use, and lubricate. This razor is 100% waterproof and can be used with foam and gel. The thin comfort blades that come with these disposable razors work well with sensitive skin. They give you a close and comfortable shave and feature a handy lube strip for extra smoothness. They also pivot to follow the curves of your jawline. A soft handle makes them easy to grip. They are also extremely inexpensive. On the downside, these razors will have to be thrown away after a few uses. For a smooth and precise shave at an affordable price, you may want to check out the Personna Men’s 3 Blade Razor. It comes with a bulk razor pack of 15 replacement cartridges and a shaving razor handle. It’s a high-quality razor kit that doesn’t disappoint. For sensitive skin, this razor kit works well because the inexpensive easily changeable cartridges help simplify your shave with their sharp, effective, and sanitary replaceable design. 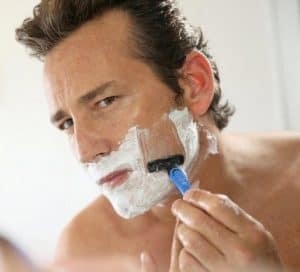 There are lots of factors to take into consideration when shopping for a razor that will cater to your individual needs. Sensitive skin comes in many forms and can require different treatment. Understanding your skin and knowing what to look for can make your shopping process much easier. Below, we have answered some of the most commonly asked questions about shaving with sensitive skin. Knowing what you’ll need can help you choose a razor that will better cater to the needs of your sensitive skin. You may be wondering exactly how you should be shaving your sensitive skin anyway. This one is easy. Wet shave only. Dry shaving with sensitive skin can literally lead to a world of hurt. Not only should you be wet shaving, you should be wet shaving correctly. As you read on. You’ll see exactly how this should be done if your skin has signs of sensitivity or is easily irritated. There are three main types of razors for sensitive skin. Each has a few benefits and disadvantages and the kind of razor that you choose will depend on your skin type and individual preferences. Safety Razors –Safety razors are one of the best options for men who have sensitive skin. They can give you a close shave with minimal irritation. These razors generally feature a protective guard that helps you to avoid cutting your face. They’re also nice and sharp which lets them glide through your facial hair with minimal resistance. Safety razors are good for sensitive skin because they’re hygienic, sharp, and simple to use. They also work well with sensitive skin balm and shaving lotion. Cartridge Razors –Cartridge razors have replaceable cartridges that attach to a razor handle. They are easy to operate and fairly inexpensive. These razors are convenient and tend to work well for those with sensitive skin. They’re simple to use and tend to stay sharp and clean if replaced regularly. Electric Razors –Electric razors can be used wet or dry. They generally work well for sensitive skin because they tend to guard the face from knicks and cuts. They utilize blades beneath a casing to remove unwanted hair and stubble. Electric razors come in rotary and foil variants. In short, yes. Skin sensitivity comes in many different forms. Generally, sensitive skin will respond to irritation with different levels of dryness, flushing or redness, and occasionally rashes. Sensitive skin also has a tendency to react to irritants with visible bumps that can be red, itchy, or painful. Some people have mildly sensitive skin while others experience chronic levels of skin sensitivity. 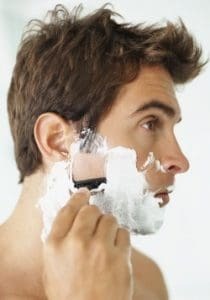 Most men with sensitive skin can still shave normally with the simple addition of the correct razor and the utilization of proper sensitive skin shaving practices. There are a few ways that you’ll be able to tell if a razor is going to work for your sensitive skin. Identify its properties – Razors for sensitive skin will be easy to handle, have blades that can be replaced or sharpened, and be free of scented or colored lubricants. Read product information – Sensitive skin is a very common condition. Razors that work well for sensitive skin will usually be marked as such. User reviews may also help you determine if a razor will work. 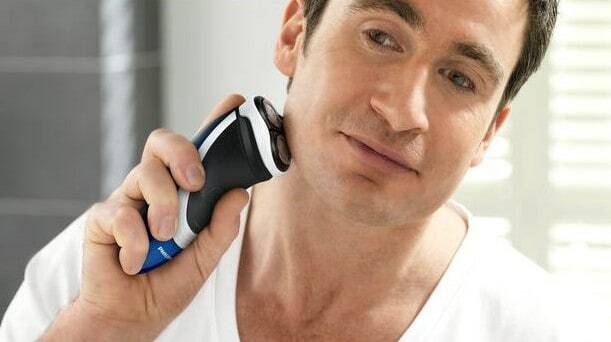 Look for a razor that promises a close shave without irritation or razor bumps. Having the right razor is important. Prepping your skin and using your razor correctly is equally as important. Even the nicest razor in the world won’t do you much good if your shaving routine is wrong. Prepping your skin, shaving in the correct manner, and utilizing proper aftercare methods are all important components of the sensitive skin shaving and care process. Having the right tools on hand will be your first step toward a close and comfortable shave. A good razor – It’s critical to have a sharp razor that you’re comfortable using. Electric, safety, and cartridge razors can all be used on sensitive skin. Clean water – You’ll also want to have a source of clean water that is the right temperature. If you have sensitive skin, stick to warm or lukewarm water. A fresh towel – Your towel can be used to pre-steam your face and clean up hair and excess shaving cream. Make sure your towel is clean. Proper hygiene is critical to keeping your skin healthy and blemish free. Shaving products – Shave balm, lotion, shaving cream, and aftershave can all help you achieve a smoother shave. Choose products designed specifically for sensitive skin. These products should be dye and fragrance-free. Properly preparing your skin before a shave is a necessary step that all too often goes overlooked. Here are a few things you can do to properly ready your sensitive facial skin before you begin shaving. Steam – Using steam or gentle warm water to open up your pores. This step helps you to more easily remove dirt, sebum, and dead skin from around hair follicles. It will also make your hair easier to trip off. Wash – Based on your sensitive skin type, wash your face with the correct products. You’ll want to use a cleanser or an exfoliator of some kind. Exfoliating can help reduce friction as you shave. Be sure to only use products that have been specifically designed for sensitive skin types. You may wish to wash your face in the sink or shower. Man-scape – Remove overgrown hairs with a trimmer or even with scissors. This will help you avoid tugging and pulling as you shave. Get everything you need ready before you start to shave. Make sure everything has been cleaned and sanitized; sensitive skin can respond quickly and negatively to bacteria. If your face has been cleaned and properly prepared, it’s time to start shaving. Sensitive skin should be shaved in a certain way to help reduce redness, razor burn, and acne. Shave in the right direction -Should you shave with or against the grain? This has been a heavily debated question for decades. The answer is with the grain. This is especially true if you’ve got a sensitive skin condition. You will still achieve a close shave. You also will have better hair follicular direction, reducing razor bumps, knicks, and cuts. Be firm but gentle – A sharp blade should shave you gently and effectively. Change your blades regularly and you won’t have to press so hard, thus reducing redness and irritation. When you’ve removed all of your unwanted hair or stubble, you may think you’re finished. You’re not. After you finish shaving, the methods you use to soothe your face are very important. Your skin is more sensitive than ever after you’ve shaved it. Certain aftershave products could cause breakouts, rashes, acne, and more. Rinse – Gently rinse your face with cool water. Be careful to avoid rubbing your face much as this can cause ingrown hairs. Pat dry – Pat your entire face dry with a clean towel. We can not emphasize enough how important it is to use a VERY clean towel. Your face is more susceptible than ever when freshly shorn and damp. Soothe – Apply an aftershave balm. Opt for a dye and fragrance-free balm to soothe your facial skin. Do not use alcohol based or scented aftershave products as there can cause irritation. Balms with aloe, shea or cocoa butter, vitamin E, avocado oil and witch hazel are generally quite soothing. Certain facial toners will also work; they help restore the PH balance of your facial skin. Handle with care – Let your facial skin absorb the balm on its own. Don’t rub it in too roughly. Try to hold off on sweating excessively and avoid direct sunlight for about half an hour after shaving and applying your balm. This will help your pores and hair follicles close back without getting too dirty. So there you are. Our top 10 best razor picks for men with sensitive skin as well as a fully comprehensive buyers guide. Clearly, our best value razor is the Butterfly Double Edge with its included packaged kit. It’s a good razor with lots of extras at an amazing price. Our ultimate winner of best razor for sensitive skin is the Feather All Stainless Steel Double-Edge Razor, Model AS-D2. The epitome of quality and luxury, the AS-D2 is ideal for anyone who wants a high-quality shaving experience that’s both effective and gentle. We hope these tips have been helpful to you and that your sensitive skin will find relief with these tips and product suggestions.